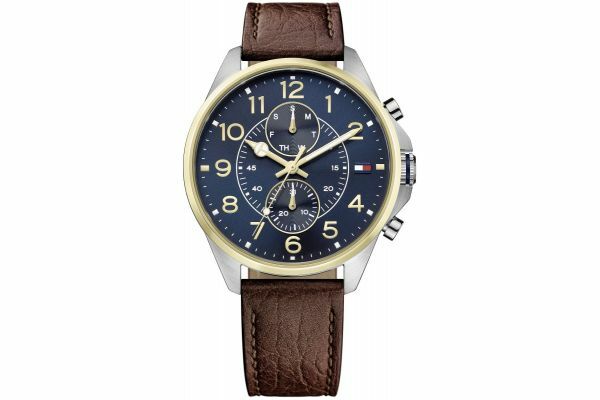 This classic men’s watch is brought to you by renowned fashion designer Tommy Hilfiger as part of their Dean collection. Featuring a dark brown genuine leather strap, stainless steel case and gold plated bezel this watch is classic yet elegant in its design. With a bold 49mm dark blue dial and two gold edged sub-dials showing the day and date this watch is both casual and functional. Simple gold batons, seconds hand and bold gold numbers complete the stylish aesthetic of this watch and further compliment the gold bezel. Powered by Quartz movement and protected by mineral glass this watch is water resistant up to 50 metres. Complete with a 2 year guarantee. This suave men’s watch is excellent for both formal and casual attire. For us to size your new Tommy Hilfiger Dean watch as accurately as possible, please take a look at our downloadable Watch Sizing Guide.